Happy New Year, beaders! The past 12 months have brought a lot of changes and challenges here on Inspirational Beading, with new series and segments added, and many left behind. December of 2013 was more bizarre and busy than any other before, so I have a lot of catching up to do in the new year. For now, here’s a look back at some of the best things that happened this year. This year's best tutorial by far would have to be the Embellished Ombre Herringbone Cuff. Not only is it the first full-length project I've featured here, but it also captures several of 2013's best jewelry trends. Hopefully, ombre is here to stay - it's way too much fun to work with in beads. There weren't quite as many fashion collages this year as I would have liked - I can't quite describe how much fun they are to make. Of those that made it, my favorites are certainly those inspired by Pantone colors. 2013 also saw the addition of recommended tutorials to the Wear It Twice segment! Although it didn't exactly fit in with the new Egyptian theme, the Tropical Toucan necklace was my favorite project this year. the entire process was an absolute delight - one of my best beading experiences of 2013. This year's most scientific and thorough post would have to be the Seed Bead Brand Comparison. but it was all worth it in the end, and I got a really fun necklace out of it as well! One segment that has continued over the years is the monthly Bead Color Ideas, although it has evolved quite a bit. This year we looked at trios that included unique focal beads and coordinating seed beads, and I think it's the most inspiring format yet. My favorite palettes this year featured some gorgeous striped glass in primary colors. 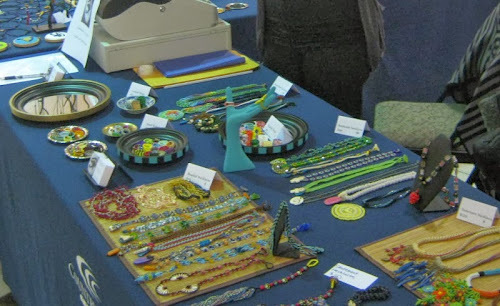 Similar to color trios, a new segment this year was Bead Stash Favorites. and I'm always surprised by how much inspiration comes just from setting out the beads and taking a good look at them. My favorite group would have to be the June Favorites, which included Egyptian pearl colors, teardrops, and lovely bone beads. 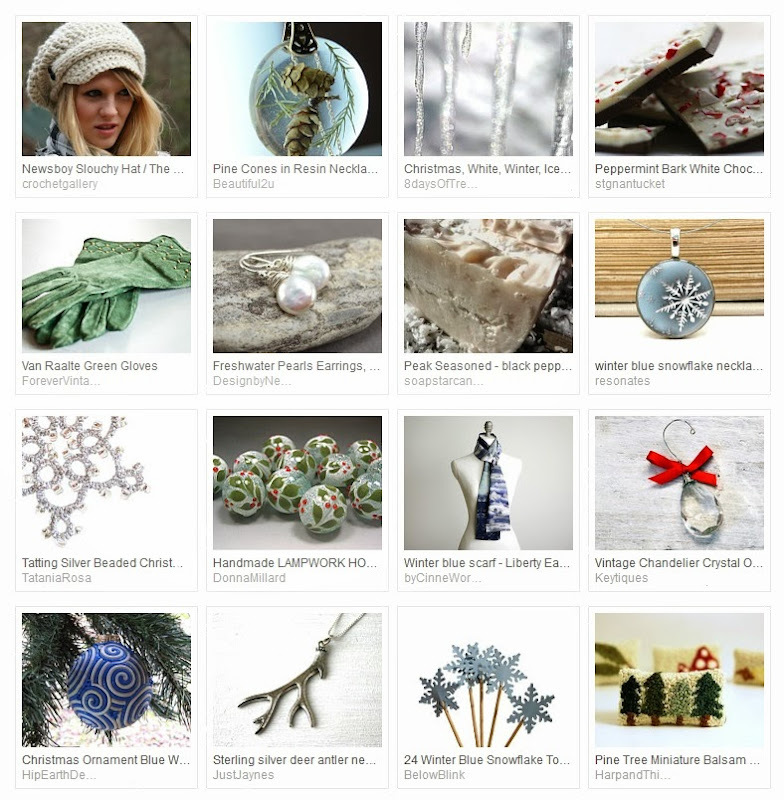 Here’s to another year of beading ideas and projects! Thank you so much to everyone who has read along so far, and to everyone who will join us in 2014. Happy beading! One of my favorite things about beadwork is that way that you can easily use color or proportions to transform a stitch into something exciting and easily recognizable. My very first independent project was to create a necklace of ordinary leaf and branch fringe that looked just like a cluster of vineyard grapes. That was when I knew that I was truly and forever in love with beadweaving. Today’s tutorial uses the same concept to create festive looks from simple techniques. The combination of daisy chain and leaf fringe provides an easy way to embellish holiday projects or dress up a Christmas necklace. You can start with a simple strand of seed beads or a beadwork base, such as a bracelet or necklace in your favorite rope stitch. Then all you need are size 11/o seed beads in bright red and dark green. Attach a stop bead to a comfortable length of thread, and weave into your base, exiting from the point where you would like to begin adding berries. To start the simplest holly motif, pick up 1 green and 6 red beads, and slide them down to the work. Stitch up through the first red bead added, and carefully pull snug to form the beginning of a daisy cluster, making sure that the beads are tight against the base. Pick up 1 red bead, and stitch through the fourth beaded added in the cluster, directly above the one your thread is exiting. Press the new bead into place at the center of the ‘berry’ and pull snug. Pick up 6 green beads and slide them down to the work. Skipping the last bead added, pass down through the fifth bead and pull snug. Pick up 3 green beads, and stitch back through the first green added in the previous step, and the following red bead. Pull snug to form a leaf. Weave back through the first berry and into the base, exiting from the next start point. You can create different looks by changing up the pattern and proportions of your berries. Add a picot instead of a leaf by picking up just 4 green beads, and stitching back through the first one again. Nudge the beads into the picot shape and pull the thread snug before weaving back through the work. Make larger leaves simply by picking up more green beads in the first step. Subtract this number by three to get enough beads to form the other half of the leaf in the second stitch. Create larger clusters of berries by adding them in a daisy chain, with 2 or more green beads in between for anchoring leaves to. You can extend these leaves away from the berries by adding 2 or more extra beads as a stem. This combination of daisies and leaves works great for flower projects, naturally, as well as other inspirations. Try using yellow, orange, and green beads (with a contrasting leaf color) to make citrus trees! The ombre project for the Egyptian God Shu is coming along slowly but surely. Beading time is always pinched down to a minimum at this time of year, but I’m getting in as much as I can. After choosing colors for this piece last week, I decided to go with simplicity and make a lariat for Shu. I concluded that the extra long beadwork allow the palette to really shine, and I could use the striped beads for fringe. It took six or seven attempts to get the pattern just right. I tried several different ways of blending the colors, and even switched from Capri blue Czech beads to cobalt Miyukis, but there was far too much contrast between them and the aqua. I finally had to give up and work the pattern without dark blue, but it may still make an appearance in the tassels. The previous Egyptian Gods piece, Sekhmet turned out fabulous. I’ll need to set aside some time to get her posted as well! Of all the hundreds of beading titles available out there, very few achieve the perfect blend of beginner-friendly instruction and serious seed bead inspiration. Of those few, a new book has emerged that is sure to be a favorite! 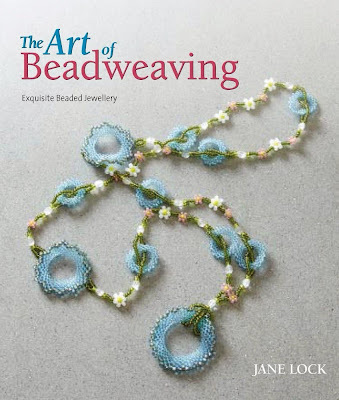 The Art of Beadwork by UK artist Jane Lock is a treasure trove of bead weaving, perfect for beginners and experts alike. The first chapter contains one of the most thorough Getting Started sections of any beadwork guide, with over 30 pages dedicated to working with seed beads and jewelry design basics. Jane has covered everything from choosing bead types to storing materials and trouble-shooting common beading mishaps. The preceding pages are filled with amazing examples of gorgeous beadwork by artists such as David Poston, Ulli Kaiser, Lynn Davy, and Jennifer Airs. Next, many favorite bead weaving stitches are explained in fabulous detail, with variations and uses clearly shown to help inspire beaders to try the techniques. Unlike many beading books, the primary stitch instructions are illustrated with photographs rather than diagrams, providing real examples of how the work might look when attempted. Included are tutorials for ladder stitch, square stitch, brick stitch, herringbone, peyote, right angle weave, cubic right angle weave, and netting. With the exception of ladder stitch, each weaving tutorial is followed by a gorgeous project to try, with clear diagrams and step by step instructions. Then it’s on to the extras - beading techniques and styles that turn stitches into projects. The final half of the techniques chapter includes tutorials on spiral rope, beaded bezels, classic pearl-netting beaded beads, peyote triangles and squares, fringes and embellishments, and finally loom work. Each stitch includes one or more complete projects for readers to test out their skills on. 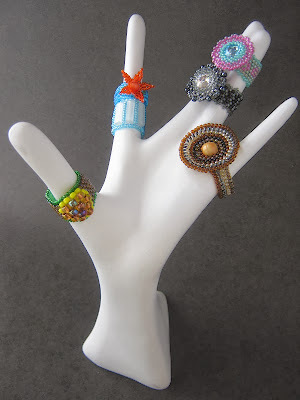 The final chapter invites beaders to really test their favorite stitches on gorgeous jewelry tutorials by guest designers like Nancy Dale, Carol Dean Sharpe, and Kerrie Slade. My personal favorite is the Nefertiti Necklace by Heather Collin, which uses cubic right angle weave to construct a beautiful beadwork focal. The Art of Beadwork is certainly my new favorite bead weaving resource, although I must confess to a bias, as two of my designs are featured within the pages. The Cherry Blossom pendant is included as an example of circular peyote stitch, and the basics section features the Quetzalcoatl necklace in a look at “color schemes in action”. 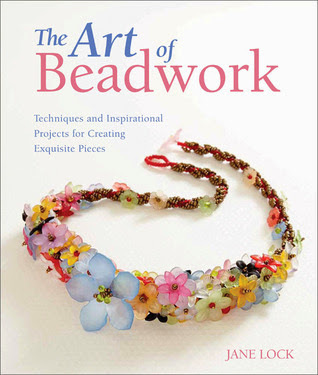 It was a great privilege to contribute to a wonderful volume on beadwork, and a thrill to see the Cherry Blossom pendant on the cover of the UK edition, The Art of Beadweaving. If you’re just starting out with beadwork, or want a fresh look at your favorite techniques, The Art of Beadwork will not disappoint! I would like to thank Jane Lock and Quarto Publishing for allowing me to take part in this book, and for providing me with a copy for my collection. Inspirational Beading has not received compensation for featuring this review, however, actions you take from this page can result in a commission for Inspirational Beading. This week’s bead tray is covered in beads, as I’m just starting the planning stages for a new Egyptian Gods design. So far all I know is that it will be ombre, and that the seed bead palette will come as close as I can get it to match a strand of deliciously striped Indonesian glass beads. I can’t wait to get started! The palette of whites, blues, and creams is inspired by Shu, the Egyptian god of air. I actually started with the seed beads, and realized that if I added a touch of topaz, the palette would be perfect for my striped beads. How could I resist? Often beads that look irresistible on the strand can be a bit vexing once they’re in the studio. One way to find the right way to use them is to play with color combinations until inspiration strikes. For this month’s color trios, I decided to search for ideas that would help me put some gorgeous coconut daggers to good use. The organic appeal of natural beads always keeps me coming back for more, and when I spotted some lovely coconut wood chips at Happy Mango Beads, I just had to have them. Because they’re center-drilled, the perfect method for using them isn’t immediately apparent - apart from some lovely fringe, of course. I started my color experiment with some earthy colors to compliment the natural beige of the coconut shell. Opaque lime green 8/os add a dash of freshness that could represent spiny cacti or rustling Grass Skirts. The organic swirls and warm tones of brown mix druks perfectly compliment the daggers. Continuing with a tropical theme, I returned to one of my favorite palettes for cheerful beadwork: Pina Colada. Opaque dark yellow and light blue make a great pair, and the addition of the coconut beads gives them a more authentic look. I can see this trio making a wonderful embellished spiral rope. The final palette creates a bold background for these unusual beads. Black Forest Flake started with some cherry red white-hearts, which looked fabulous with the coconut at first. The trouble was finding a third color that didn’t clash with either. Playing it safe, I went with shiny jet black, but some green white-hearts would make a great festive palette. What’s your favorite natural bead? How do you like to use them?